These knee high cat socks are for children age 3 - 6, shoe size 8 - 13. 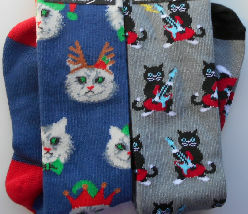 The blue socks on the left feature a cat with reindeer horns, a red bow tie and a Santa hat. 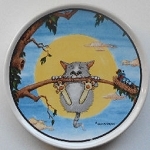 The grey socks on the right feature a tuxedo cat playing an electric guitar. New.